The bass part for Strauss' Death and Transfiguration (Tod und Verklärung) has been edited by Paul Ellison, in-demand double bassist, professor, presenter, and former Houston Symphony Orchestra principal bassist of 23 years. Ellison's bowings, fingerings and other editorial markings have been added throughout the score. Strauss began work on his tone poem Death and Transfiguration in the late summer of 1888 and completed it on November 18, 1889. Scored for large orchestra, Death and Transfiguration depicts an artist who reviews his entire life in his mind's eye as he lies dying. His childhood innocence, the struggles of his manhood, and the attainment of his worldly goals all lead him to his longed-for transfiguration in death. The work is dedicated to Strauss' friend Friedrich Rosch. 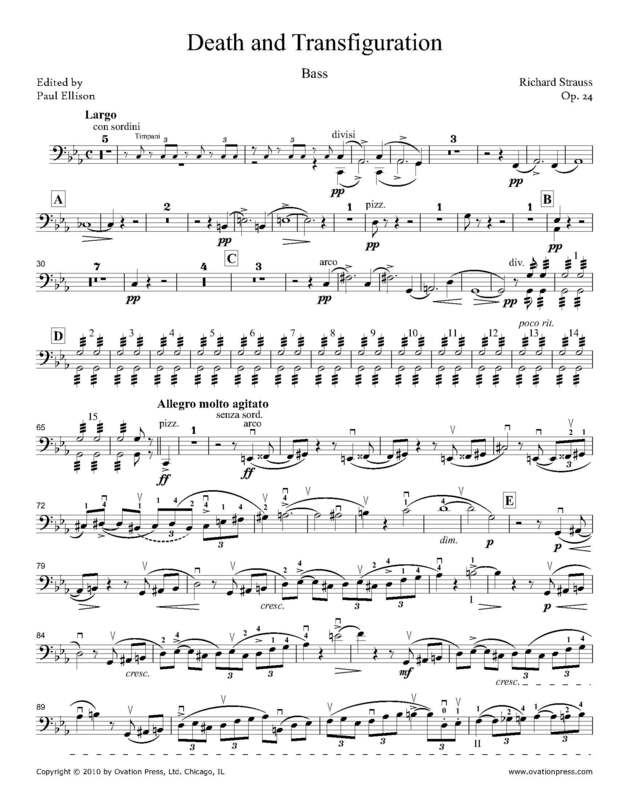 Download and print the score today to gain access to expertly edited Strauss Death and Transfiguration bass fingerings and bowings from Paul Ellison!